SME Stock Exchange – Viable option for Indian Startups to raise funds? SME exchanges have been recently set up in India by BSE and NSE to provide a new way of raising capital from the public to the small and medium enterprises (SMEs). To understand why the concept of a special exchange for SMEs was introduced, we must understand how a company raises money for its operations. There are two sources of raising finance – equity and debt. Equity funding can be raised either from the public through stock exchanges in case of listed companies, or can be raised from investors (such as private equity or venture capital funds, HNIs or companies). The cheapest source of capital for a company is to raise money from the public, as such money can be raised without onerous conditions (unlike a VC or PE fund or even a strategic investor will impose) and there would be no necessity to pay back such money to the investors or provide a profitable exit like a VC or HNI investor will demand. Investors who buy stocks on a stock exchange only, expect to get dividends if the company profits. While debt is usually a cheaper source of capital than VC, PE or private investor money (as there is a fixed cost and there is no need to share the upside earned by using the capital), there is always a pressure on the company to pay interests regularly and pay back the principal after a fixed amount of time, and failure to pay back the debt within a fixed timeframe can result in bankruptcy of the company (for more details on what else you can do if your company fails to repay debt, see here). This is why raising capital from the public through a stock exchange is usually the most preferred way of raising capital for big companies. While smaller companies will also love to be able to raise money this way, most of them cannot access the stock exchange route to raise capital as only companies with a high paid-up capital and a history of profitability were so far allowed to list on a stock exchange and source money from the public, on the basis that a company sourcing money from the public should have a certain scale and reputation, so that it does not run away with public money. Startups could only take loans from banks or financial institutions, or they had to find investors who could invest large sums of money in the company and take an equity stake (which is generally not easy for them). As they could not source public funding, startups could not compete with larger businesses on equal terms, which had cheaper sources of funding available to them. The financial crisis led to a slowdown in the growth of large companies, and an increased focus on small businesses and startups, as the latter had significant potential for growth. In India, SEBI has come up with a special framework that existing stock exchanges can adopt for Small and Medium Enterprises (SMEs) recognizing their systemic importance to the Indian economy and to help them to grow faster (discussed in brief on our blog previously). Under the new framework, existing stock exchanges can open a special segment called the SME Board for trading. The purpose of this framework is to provide special incentives for SMEs to list on public exchanges, and to provide them liquidity and access to cheaper sources of funding. The terms for listing on the SME segment are different from those on the main stock exchange. In order to be eligible to list, companies must have a minimum of 50 investors and a paid-up capital (after listing) of at least INR 50 lakh. Financial results shall be submitted on half yearly basis instead of a quarterly basis. SMEs need not print and send their financial results to individual shareholders, as required in respect of companies listed on the Main Board. They can simply make it available on their websites. SMEs can send the abridged version of the annual report of few pages with the details of the profit & loss account and balance sheet to the shareholders instead of sending physical copies of full annual report. Profitability record: The condition of having a track record of profit making for 3 years out of last 5 years as applicable for listing an IPO on the Main Board is not applicable for listing on the SME exchange. IPO Grading: For companies seeking listed, SEBI has made grading of the IPO mandatory. For SMEs, grading is not mandatory if they list on the SME Exchange. Tax advantages for shareholders: During the initial stages, promoters may have a huge shareholding in their startups. At subsequent stages (or if the startup is performing well), promoters have the option of selling their shares (partly or completely) to an acquirer (which could be a financial investor such as a venture capitalist/ private equity investor or any other buyers). If an SME is unlisted, its shares will attract short term capital gains tax upto 30% (the actual rate will depend on the income tax slab applicable to the individual shareholder concerned) or long term capital gains tax of 20% on the sale of shares, depending on the time period for which the shares are held. For listed securities, short term and long term capital gains tax rates are 15% and nil respectively (if Securities Transaction Tax (STT) has been paid, which is a very small percentage). As the promoters of SMEs tend to hold a large percentage of shares of the company with them, they will benefit from lower tax rates if they sell their shares on the SME Exchange. The regulations do not prescribe an upper limit of investment by investors, but prescribe a floor of Rs. 1 lakh of minimum investment to keep retail investors at bay from the SME exchange. Further, the minimum trading lot for a transaction must also be Rs. 1 lakh. Since a buy or sell transaction on the exchange must comprise minimum of 1 lot on the exchange shares worth Rs. 1 lakh must be transacted in a single transaction. Owing to the higher minimum transaction size, the SME exchange is likely to witness activity from high net worth individuals, institutional investors and banks (who are informed investors) only who are usually risk averse and will be very circumspect about investing in the new SME stock exchange. In essence, the SME exchange has to compete with the main exchange to attract investors, and keeping retail investors at bay and having a minimum transaction size of Rs. 1 lakh can make it difficult for the SME exchange to find investors. The costs for a company listed on the SME Exchange may shoot up because of increased compliance obligations on merchant bankers in respect of its shares. A company whose shares are listed on a stock exchange is required to appoint its own merchant bankers, who must be compensated by the company for their services. Although the terms of appointment of the merchant bankers are contractual, the merchant bankers’ obligations are as per the applicable SEBI Regulations (in this case, the Issue of Capital and Disclosure Requirements Regulations) and stock exchange bye-laws and rules. – i) Merchant Bankers in the main board assist the company in raising equity capital only through the primary market (that is, at the time of issue of shares only), but in the SME Exchange, they have to continue market making for a period of 3 years in the SME’s stock, after listing. Market making involves holding a certain percentage of the shares at all times and providing quotes (for both buyers and sellers) for a specified percentage of the trading hours each day. Merchant bankers are likely to charge a higher fee for this. Clause 49A of the Listing Agreement on Corporate Governance will be applicable to the SME Segment. There has to be 50% independent directors on the Board of listed SMEs. They need to appoint various Committees as stipulated in Clause 49 of the Listing Agreement. As per a circular of the BSE dated 27 March 2012, annual fees will be charged at Rs. 25,000 or 0.01% of the full market capitalization (not issue size), whichever is higher. The SME Exchange may emerge as an important platform for start-ups to raise funding in the future, especially for raising growth capital. However, due to operational issues such as finding a merchant banker willing to underwrite a startup 100% or lack of investors ready to make big investments in this sector, the SME exchange route doesn’t seem to be a serious funding option for startups in India just yet. The SME Exchange will be more suitable for companies which have already achieved a minimum scale of operations, and not for early stage start-ups even after these operational issues are sorted out. 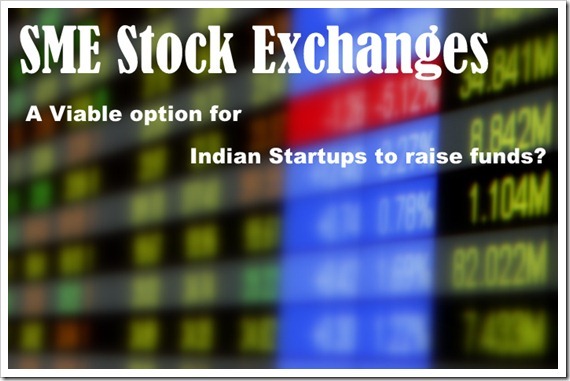 "SME Stock Exchange – Viable option for Indian Startups to raise funds? ", 5 out of 5 based on 1 ratings. 5 Biggest, Funded Startups Which Shut Down In 2016!